Oh blimey. It's that time of year. Worse than 'World Book Day'. It's the annual 'Easter Crap Hat Parade'. You can't buy these. You can't fob off your kids with a Disney Princess outfit you brought last minute in Asda. In your head, around Good Friday last year, you made a vow that this year would be different. This year you weren't going to be caught short. 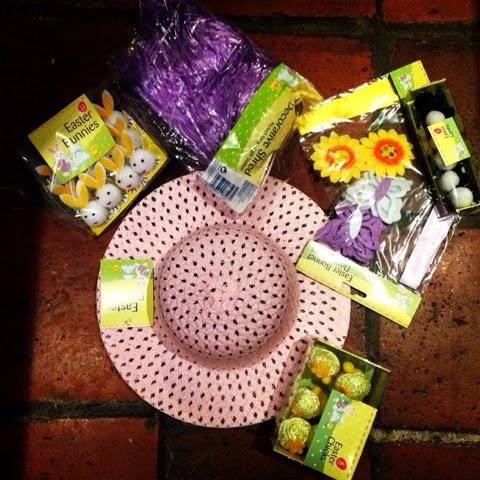 This year your little one was going to rock an Easter hat so hard people would applaud, weep even. Jesus would be high fiving the angels in heaven whilst God shouts "Hell Yeah!". And as per? You have f*cked it up massively. So here are the dreams you so long for and the tragic reality of Easter Hat Making. The dream: After World Book day you instantly created a Pinterest board entitled "Ambitious Easter Hats". You spent hours deciding if you were going to go a religious route or focusing on delicate and beautiful shabby chic bunny ears. The reality: After 'World Book Day' you recuperate and promptly forget all about the impending day. Until you see a sign on the preschool door announcing 'Don't forget Easter Hats on Friday! Prizes on offer!'. Sh*t! Your daughter still hasn't forgiven you for not remembering there was a 'Red Nose Day' dancing in red (?!) competition. You run home, search the fancy dress box for last years hat. See it's clearly died and can't be resurrected. You weep and Google 'easiest Easter hats ever known to man'. Look at the pictures. And weep again. The dream: Your house already contains various bits and bobs. Cath Kidston swatches and the like. Your Mum has knitted teeny tiny chicks and you remembered to hold on to last years hat so can easily reuse it! Result. The reality: You run to Poundland the afternoon before the parade. Raid their shelves. Sweating profusely. Chucking in a cheap pack of Crunchies and some Fruit Pastilles for your efforts. Now what the hell do I do with all this sh*t? The dream: Ah the joy of working with your small child. They sit patiently. Never touch the super glue and really offer some good input. Marvelling at your genius. Exclaiming it is the best hat they have ever seen whilst you discuss if Jesus really existed. The reality: STOP PUTTING F*CKING SUPERGLUE ON THE DOG!!!!! The dream: Yes! I have done better than last year! Ordering those little lambs from America was inspired! You put a photo on Instagram and get 100 likes within five minutes. You still have a week to go to the big event so you pop it on a top shelf to be a festive display for a few days. So you can show it off to your family. And everyone can marvel at your creative genius. Last year Poundland threw up on my daughters head. This year? The same will happen. The dream: Your child manages to keep the hat on on the long walk to school due to the ribbon you cleverly tied on it. They walk into the playground and everyone turns to stare at the masterpiece whispering "gosh now where did she get those tiny sheep?". Of course you win. And everyone is happy. ...some poor sod walks in in just a highly unreligious Spiderman baseball cap and you mentally fist punch the air. Congratulating yourself for making an effort. You are Super Mum!!! When I saw this post pop up ... I just knew that you were going to have had oodles of creative fun! Ha ha! Go Super Mum! 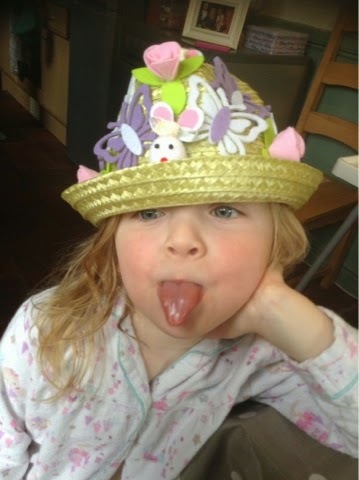 I quite fancy having a go at making an Easter bonnet, even though Elsa isn't at school and I don't have to! Am I insane? !